Featured today is a special two-gem pendant with just the same uplifting and healing attributes. The pendant cast in sterling silver has a round cabochon natural Indian blue moonstone of 1.47 carats and a triangular cut natural organic Italian white coral of 1.73 carats set together. Natural blue moonstone or chandrakantmani is the substitute gem for natural pearl or moti/ mukta and is the gemstone of planet Moon or Chandra. The blue moonstone is a phenomenal gemstone displaying lovely adularescence or schiller visible across its surface. 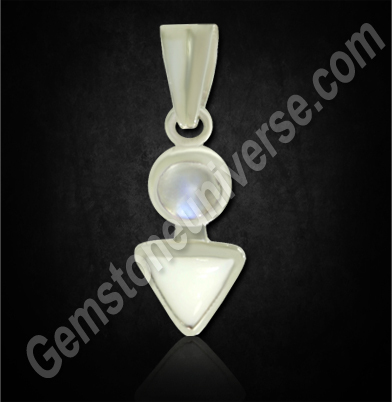 Natural blue moonstone is a gem suitable for cancer ascendant individuals. In other words, it is a jyotish ratna for Kark lagna individuals. Natural organic white coral or safed moonga is a gemstone used specifically to address problems posed by a debilitated Mars in the natal chart. It is an opaque white gemstone of organic origin. When Moon in the chart is afflicted and the planet Mars is weak too, it can severely cramp the day to day functioning of an individual. There are many complexes and mental monsters to deal with. Since Mars finds debilitating in the sign of Cancer (ruled by Moon), the it affects the individuals sensitivity, either taking it to hypersensitive levels or rendering an individual very cold. It also affects the stability and decision-making capacities, where an individual may come across as fickle minded. Read more about deeply incapacitating planetary positions by clicking here. White coral imparts a great deal of stability and restores balance in the individual. The gemstone of the moon on the other hand, gives strength of mind and level-headed thinking. Comments When you have the desire to get the most optimal solution, you can get it provided you are willing to follow through with a flawless process involving the best products and services. Planetary gem therapy for best results requires you to ascertain that the gemstone recommendation you get is proper and that your gemstones are jyotish quality. Featured today is a premium natural Burmese Peridot of 2.85 carats set in a sterling silver as a Mercury talisman. 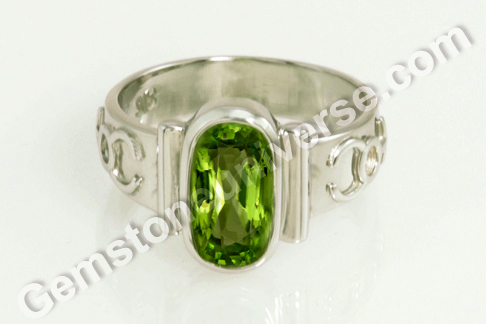 The oblong cushion shaped Peridot has the perfect olivine color and superb clarity. What sets this talisman apart is that it is a Mercury Planetary Bhasma ring, with the sacred herbal ash or bhasma of Apamarga sealed into the tubular channels that run along side the gem. Note that the symbol of Mercury stands in relief on the shanks of the ring. Natural Peridot or Zabarjad is the gemstone of planet Mercury and Apamarga is the sacred planetary herb of Mercury. 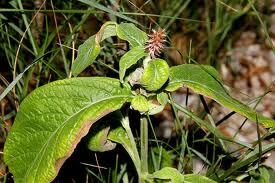 Apamarga is also known as Devil’s Horsewhip in English and goes by the botanical name of Achyranthes aspera. 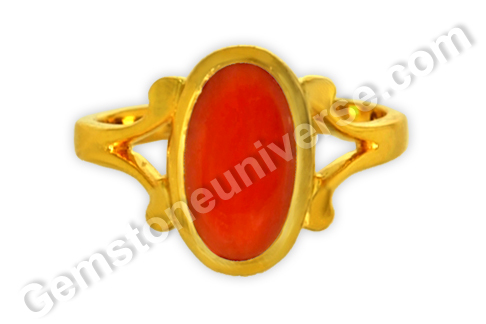 Click here to see the entire range of Gemstoneuniverse Planetary Bhasma Rings. Click here to see what makes Gemstoneuniverse Planetary Bhasma rings so special! While peridot has been known as a powerful healing gem even in the world of crystal healing, besides planetary gemology, when the power of Apamarga Bhasma gets combined with it, the result is a very powerful talisman. Apamarga is a fantastic herb and its use is described in Ayurveda for a treating a host of maladies – It is a potash rich plant that is used as a herbal litho-triptic agent (that breaks the urinary stones) and is a diuretic. It is used to treat urinary afflictions like calculus and irritation in the bladder and the urethra, colic, ear infection, bronchitis and skin diseases. Not surprising really as medical astrology outlines, lungs, skin, kidneys etc. as the domain of Mercury. Comments There is hardly a gem that matches up to the perennial appeal of the all time favourite – the pearl. 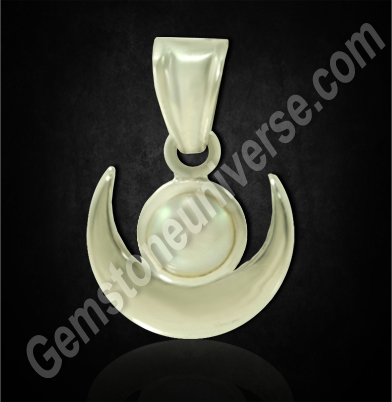 Featured today is a fine specimen of what a true jyotish quality natural pearl should be. A button shaped luminescent fully natural undrilled and organic Australian pearl of 2.80 carats set in sterling silver as a Moon talisman pendant, nestled in the centre of crescent Moon. The natural pearl is a fine unblemished white color with hardly any overtones sullying its pristine pure appeal. The Australian pearl has a lustrous glow and radiates pure moon energies. Natural pearl also known as moti/ mukta is the gemstone of Planet Moon or Chandra. It is a gem that is the most favorable gemstone for kark lagna. In other words, it is a gemstone well suited for cancer ascendant. Cancer is a sign ruled by Moon. Let us get to know something very interesting about the pearls – simpatico. It is not an inherent property of the pearls. The word literally means having the same temperament of that which is compatible. 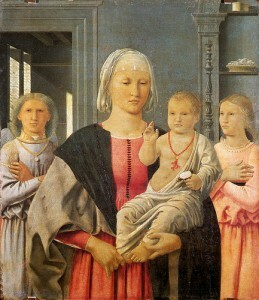 It is actually the appearance – color/ orient of the pearl vis-a-vis the appearance of the skin of the wearer. Aside of the natural origin and lustrousness, the connoisseur always looks for the simpatico, the suitability of the pearl against the skin color. 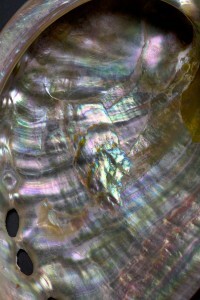 This feature has acquired importance in light of the fact that the surface of the pearl is irregular (very clearly seen under magnification). When light bounces of against this irregular surface, the result is prismatic colors being reflected back or iridescence also known as the orient of the pearl. Comments The sapphire is an enchanting gemstone. The birthstone for the month of September, the watery clear crystal and mesmerizing blues of sapphire have captivated human beings. Featured today is a beautiful natural unheated and treatment free Ceylon blue sapphire of 3.44 carats set in sterling silver as a Saturn talisman – a wonderful natural blue sapphire ring. 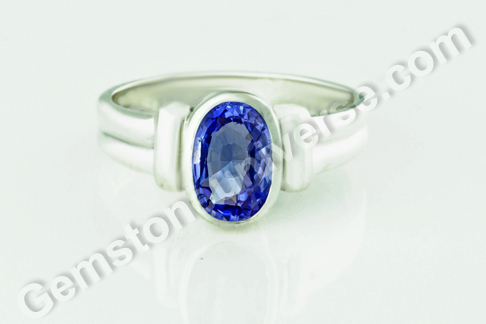 The oval shaped natural Ceylon blue sapphire has a rich silky cornflower blue color. The blue sapphire gemstone has electric lustre and mind-blowing clarity. The gem has a very good jyotish weight. Natural blue sapphire or neelam gemstone is the gem of Lord Saturn / Shani. 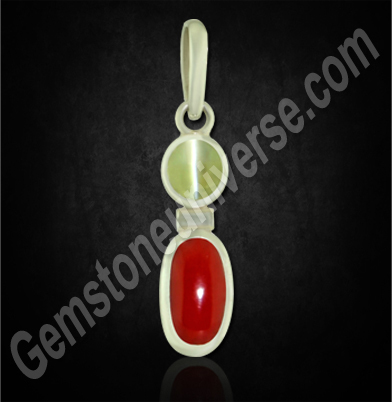 It is a favorable gemstone for makar lagna and kumbh lagna individuals. In other words, blue sapphire is a favorable gemstone for individuals with Capricorn or Aquarius ascendant. Blue sapphire assumes special importance for the Vrishabh lagna individual, as Saturn in this case rules the 9th trine house of fate and fortune as well as the 10th quadrant house of profession and karma. Here is one of the world’s most spectacular, in fact the largest sapphire- The Millennium Blue Sapphire. This gem was found in Madagascar with Initially a weight of 90,000 carats. This largest known blue sapphire has a certification from AIGS, Thailand. 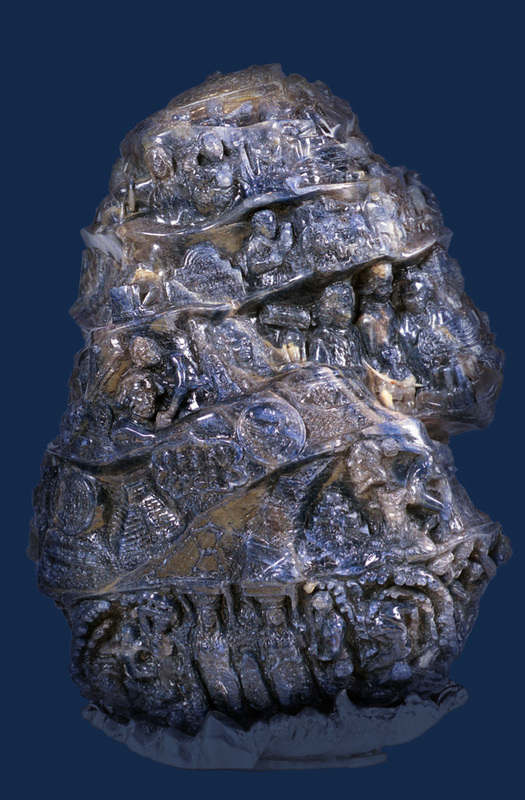 The gem was then decided to be carved upon with scenes depicting the landmark achievements of humankind known after which its final weight was 61,500 carats. The nearly 134 carvings include depiction of major individuals like Columbus, Shakespeare, Bach, Newton, Neil Armstrong’s landing on the moon, Einstein etc., whose work/ discovery defined an era. The Millennium Sapphire made its entry into the Guinness Book of Work Records as the largest carved sapphire in the year 2001. Featured today is one such extraordinary gem – a fully natural unheated Ceylon yellow sapphire of 2.82 carats set in 22-karat gold as Jupiter talisman, a natural yellow sapphire ring. 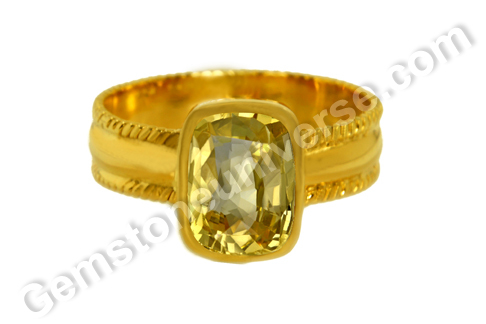 The cushion cut Ceylon yellow sapphire has the best-valued golden canary yellow color. The brilliant yellow sapphire gem is eye clean and has a superb lustre. Natural yellow sapphire also known as pukhraj/ pushyaraag is the gemstone of planet Jupiter/ Guru/ Brihaspati. Lord Brihaspati is the mentor of the gods and the chief priest. He stands for the awareness, spiritual enlightenment and wisdom. The benefits of Pukhraj gemstone are known widely. 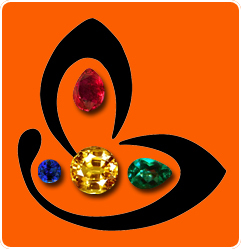 It is the gemstone for Dhanu lagna and the gemstone Meen lagna individuals. (It is the gemstone for Sagittarius ascendant and the gemstone Pisces ascendant individuals.) However, getting the birth chart analyzed for gemstone suitability should be the first step before implementing planetary gem therapy. 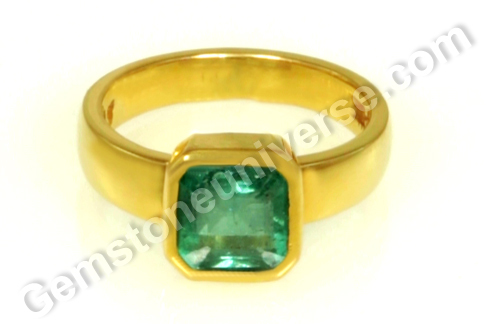 That the ancients believed in the power of gemstones is no new information. What is interesting is their deep understanding of the movement of chi or prana and how it could be harnessed through used of gemstones. In medical astrology, natural yellow sapphire is a gem that is used to improve health in case of problems due to increased sugar levels, low metabolic rate etc. However, instead of going by generalizations it is always better to consider planetary positions in birth chart and planetary period in operation before prescribing gems. Every horoscope is unique and will require different remedies. Featured today is a natural unheated treatment free ruby from Mozambique. The oval shaped gem has a weight of 1.07 carats and an appealing deep vibrant reddish pink color and has been set in 22-Karat gold as a Sun talisman. The natural ruby has fantastic clarity and good lustre. Just have a look and at the video and see how pleasing color and a good cut sets this Ruby miles apart from the rest. Natural ruby or manik/ manikya is the gemstone of planet Sun/ Surya. It is the simha rashi ratna or singha rashi ratna. In vedic astrology, the sign of Leo/ Simha is ruled by Sun. 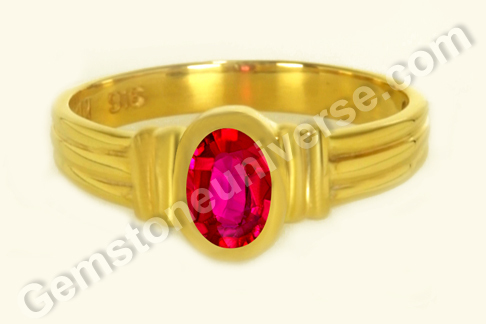 The manik gemstone or ruby gemstone is one with intense, fiery Sun energies. We strongly recommend that an individual should get a proper gemstone recommendation before deciding to wear a ruby. Also be very wary of sellers trying to palm off random goods as Mogok rubies from Burma. Please bear in mind that the Burmese ruby is invariably imperial pigeon blood red in color. Also, a natural untreated, unenhanced genuine Burmese ruby no matter how small will not retail less than USD 6000 – 7000 per carat. The price only increases phenomenally as the gem’s assessment on the 4 Cs scores better and better. Now that you know the actual situation of the World’s Ruby Market- Never encourage misnomers and misleading terms such as Old Mine Burma Ruby or New Mine Burma Ruby. You have tangible information about pricing and hence please don’t be lured into purchasing inferior quality goods labelled as New Mine or Old Mine. This is where the ruby from African nations like Mozambique and Tanzania comes into play – it has pleasing attributes and is quite affordable in comparison to the exotic Burmese rubies, which are quite elusive even to the markets! Even though new deposits are found in Mozambique the prices for really fine gems some of which( as the one featured today) are equal to the beauty of the Burmese ruby the prices for Natural Unheated Gem Quality Ruby will continue to rise. Comments Planetary gem therapy also yields equally good results when two or more gems are used in a combination, usually as a pendant. This is often done by individuals who are inclined to not wearing any jewelry on the fingers or by individuals whose profession (for instance surgeons) would require them to remove them ever so often. Featured today is a two gem pendant that has a natural and treatment free chrysoberyl cat’s eye of 2.06 carats and a superfine natural and organic Italian Red coral of 3.69 carats set in Sterling silver. This pendant actually becomes a tool of very powerful and intense transformation as it combines the planetary energies of Ketu and Mars. According to Vedic texts, Ketu gives effects akin to Mars and what can be better if Mars happens to be a favorable planet for the individual! The beautiful natural Indian Chrysoberyl cat’s eye is a very pleasing Neptune green in color and is a round cabochon-shaped gem. It displays great chatoyancy (has a sharp white silky band running across its surface that can be observed to move with the movement of light) and is translucent as a good cat’s eye should. The robust natural and organic red coral is an oblong oval with finest Mediterranean ox blood color. The natural red coral is an opaque gem of organic origin. Cat’s eye is a phenomenal gem (displaying an optical phenomenon of chatoyancy)and is also known as Lehsuniya/ Vaidurya/ bidalaksh or Sutra mani and set in a talisman is used to harness the energies of Ketu. It is the gemstone of the mystical planet Ketu or the South Node of the Moon. Natural red coral also known as praval/ moonga/ vidrum. Natural red coral is the mesha rashi ratna and also the vrishchika rashi ratna. It is the gemstone of planet Mars/ mangal/ kuja/ angaraka and is used in a talisman to harness its vibrant energies full of vitality and life force. Comments There is hardly anything that is as symbolic of the moon as its gem – the natural pearl. A good natural pearl is a spitting image of the soft and serene luminary that adorns the night sky. Pearls have enamoured gem lovers for centuries altogether where the collectors have happily paid a handsome amount to procure nature’s best. Featured today is a fine natural and organic Australian pearl of 1.95 carats set in a sterling sliver pendant as a moon talisman. The button shaped natural pearl is a luxurious glowing white translucence that is reminiscent of a haloed Moon. 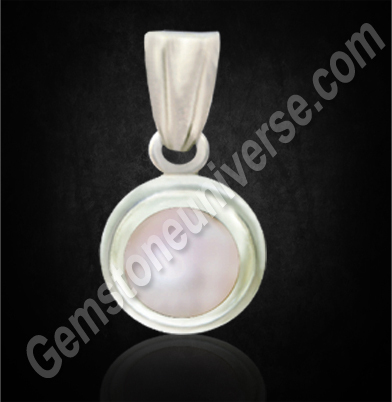 It is a jyotish quality natural pearl which is pristine glowing white and not chalky or dull. In case of the pearl, light has a distinct way of bouncing off the nacre, giving it a soft glowy lustre unlike that in the case of transparent gems. The natural pearl is an organic gemstone with several layers of nacre constituting its body. A pearl is formed in a mollusc – oyster, when a foreign object invades it. When the irritant cannot be ejected, a process known as encystation starts and the nacre is secreted as a defensive response. 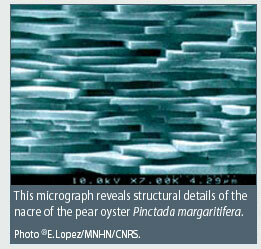 Nacre covers the irritant in successive, concentric layers. Natural pearl also known as moti / mukta is the gemstone of Planet Moon/ Chandra in Vedic astrology. Moon represents the soft yet powerful divine feminine element. Natural pearl is the kark rashi ratna or gemstone for the sign of Cancer. Moon is the significator of the mind and plays a huge role in unfolding of emotions, feelings, ability to rationalize and perception in an individual’s life. An afflicted or weak moon in a natal chart can severely hamper even day to day functioning of an individual. Wearing a natural pearl after a proper gem recommendation can yield benefit in such a case. Featured today is a natural non-oil treatment free Zambian emerald of 1.69 carats set in 22-karat gold as a Mercury talisman ring. The classic step cut natural emerald has a deep emerald green color. The dainty gem has good clarity (considering we have an emerald in question, which is a naturally occurring highly included gem in most cases). In Vedic astrology, natural emerald or panna is the mithuna rashi ratna and kanya rashi ratna i.e, the suggested gem for the signs of Gemini and Virgo. It is the gemstone of planet Mercury/ Budh who rules over the signs of Gemini and Virgo. However, it is always best to get a proper gem recommendation before implementing planetary gem therapy or choosing a lucky stone / birthstone. Zambian emeralds are famed for a richer green color with intense saturation. 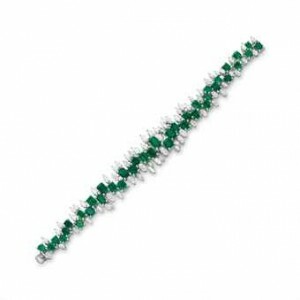 Here is a beautiful bracelet with diamonds and natural Zambian emeralds that went under the hammer at Christies and fetched a whopping $266,500. The emeralds have great clarity giving it a luxurious appeal.